While the packet is fairly self-explanatory, here are a few notes about how this part of the unit is organized. Les Fruits. (1-2 days) For this lesson I will play a short video with fruit vocabulary using the projector and the students will complete a matching activity in their packets. They will then complete a pair activity in which they describe pictures to a partner who finds the matching picture on his/her own paper. (fruit pair act) I will follow this up with a formative assessment in which I describe a few of the pictures and the students identify which picture I am describing. The students will then read an article about bananas and complete an abbreviated interpretive task. As a closing activity they will listen to a song about fruits. I have also included a website for vocabulary practice and worksheet (prendre ws) for this lesson. Although I’ve managed to avoid grammar/vocabulary worksheets so far with these students, I felt that it was important to focus briefly on form, in order to increase their accuracy and move them along to a Novice High proficiency level. Les Légumes (2 days) The students will also begin this lesson with a video and matching activity from the Le Monde des Petits series. They will then complete an interpersonal activity (veggiepair) in which they describe pictures to a partner in order to determine whether they have the same or a different picture for each number. As a formative assessment, I will ask a series of true/false statements about some of the pictures. I will, of course, only ask questions about the pictures that were the same on both papers. After this interpersonal activity, the students will watch a video in which a nutritionist talks about eating five fruits/vegetables a day. Because this video is not from Youtube (which is blocked on my students’ accounts) I intend to have the students complete this activity individually using the department IPads. After the video, the students will interview a partner about their vegetable preferences and then listen to a song about vegetables. The order of this lesson might change slightly depending on how far we get each day. I would use the song as either a closing activity or as an introduction at the beginning of a class. I have again included an accuracy worksheet here (veggie ws), as well as assigned a website for homework that they can use to review vocabulary. Ce que les Francais mangent (1-2 days) After building the students’ vocabulary with these lessons, I will continue the unit with lessons to develop their knowledge of French eating habits and increase their overall proficiency. In this lesson, we will first look at a website that shows how much of several different foods/dishes are eaten by the French per second. After responding in writing to a few questions about the information at this site, the students will interview each other about the frequency with which they eat the same items. They will then read an article about what the average French person consumes in a year (ce_que-consomme-1-francais) and complete an interpretive task. Following this activity, they will respond to a series of statements by writing French sentences based on the same article. Lastly, they will play a Guess Who game (Guess Who) designed to review some of the vocabulary for lunch and dinner dishes. Because my students are familiar with this game, I did not devote space for the directions. However, if you’re new to this game, each partner selects the identity of one of the names on the paper. They then take turns asking questions about what their partner is having to eat in order to determine their partner’s identity. (Tu prends de la pizza?) This game is easier for students when the papers are placed in plastic page protectors. This allows them to use dry erase markers to eliminate identities as they ask questions. I am also able to use this activity on another day, if I need a short filler. Le Fast Food (2 days) I will begin this lesson by projecting a couple of MacDonald’s commercials. Although I have included a few comprehension questions in the packet, I would not expect these students to be able to answer them independently. Instead, I will play the video in its entirety, and then pause it frequently, inviting the students to informally (I just have them shout it out) share anything they were able to understand. 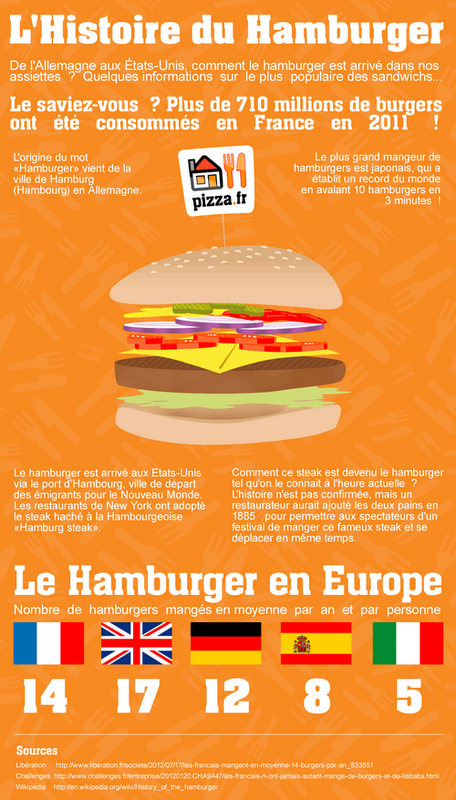 After the video, the students will read an infographic on hamburgers and another on French fries (fries infog) and complete an abbreviated interpretive activity. For the following activity, they will interview a partner about his/her fast food preferences. I have provided possible answers, to provide the necessary vocabulary to the students. As a culminating activity for this lesson, the students will write a paragraph describing their fast food habits. So, that’s what I have so far. The final lessons for the unit will be organized around the context of the school cafeteria, and eating out/restaurants. I’ll post them when I’m finished—make sure to follow the blog for updates! As always, I’m happy to answer any questions you have about these lessons and am grateful for any feedback that you have. This entry was posted in French 1 Units and tagged food on January 18, 2015 by madameshepard. I assign each kid a different fruit or veggie to “be” the next day….classmates will guess who they are. I just started using some of this unit and it’s so fun! Do you have an IPA for it? Thanks again for sharing your hard work and inspiring other teachers to do the same. I just found this unit, and also noticed that the youtube clips are no longer available. Any suggestions? I’m so sorry that the clips are no longer available. I wonder if you could substitute another video? And I found this for 2 sandwiches…. maybe not the same one? Merci beaucoup! Thank you for the link to the correct site! I hope this question isn’t annoying…I’m taking baby steps on my switch to proficiency based teaching. A point of clarification…you use the lessons listed in Day 1, Day 2, etc for in class work, and the official summative assessment is the IPA you posted in the above comment (Troto videos)? Students work alone on the IPA for the final assessment? Do you find students are tired of the same format, or on the contrary, do they feel prepared and competent because they know the format so well? I’m feeling stuck as to how to assess and implement all this. It feels like such a huge undertaking. I love how your summative IPA (if that’s what I should call it) includes the rubrics right on the sheet. That’s very helpful. Any guidance as to how I should get started and abandon my textbook completely? You have been an absolute life saver as I transition to more proficiency based tasks. By any chance do you still have access to the two McDonald’s commercials that you used for Le Fast-Food? Sorry, but I do not. If anyone is interested, I also found a cute “J’ai..Qui a…” game to practice le vocabulaire des legumes. Did you ever finish out this unit with a section on eating out/restaurants? Just wondering as this is one of the only things missing from this amazing unit! There’s a Bon Appetit part 3 post. I found this YouTube about petit déj and thought you might like it. My eyesight must be going….in the fruit.pair.activity, what is the girl in pictures 2 and d eating? I tried to enlarge it a bit–it looks like she is eating a sandwich? Also, there are fruits on the pair activity which were not mentioned in the video for Day 1 and 2 (peach, raspberry, grapefruit, cantaloupe, maybe lemon–hard to tell). Do you do anything special to teach those so that the students can complete the pair activity (e.g. a different video, pictures with the French word underneath, a list on the board)? Here’s a nice short article with an infographic for a reading activity. There’s a lot of cognates here for them. Instead of simply doing an interpretive reading and aswering questions, I asked my level 1 classes to read and make a short video (in English) summarising the information from the article. Hey just FYI the link in the vegetable section of the unit packet for the Vitamin C video/infographic is no longer a working link. The page is fine, but the graphic is gone. It took me a few minutes to find it, but it worked! Hello, is there a master list of the vocabulary you are teaching for this Unit? This would help me see the big picture. Hi, Julia I did not have a mastery list for this unit. As is often the case, my goal is just for my students to meet the goals/Can-dos I have established for them, as demonstrated on the IPA and other assessments. Each student will end up learning the vocab which is most relevant to her.